As many of you know or may have heard, last month at the annual Golden Crown Literary Society conference, I sat on a panel called “Eat Your Heart Out.” My fellow panelists were RG Emanuelle, Mary Griggs, and Karin Kallmaker, and what we all have in common is the fact that food tends to play a large role in much of our writing. It was a fun panel, lots of joking as well as some serious talk. At the beginning of the event, audience members were asked to write out three suggestions on small pieces of paper and deposit them into three bowls. One was to be a protein, one was to be a vegetable, and one was simply, “other.” Each panelist chose one slip from each bowl and was tasked with creating a dish that included those ingredients. I will stress two things. One, the drawing was NOT rigged (despite what my fellow panelists might think). Two, I got extremely lucky because I drew bacon, artichoke hearts, and pasta. I realize how it looks, since RG had to incorporate gummy bears and Karin’s protein was herring. So, amidst the loud shouts of my fellow panelists calling foul, I proceeded to make my dish. And it was delicious. Ready? Aprons on! 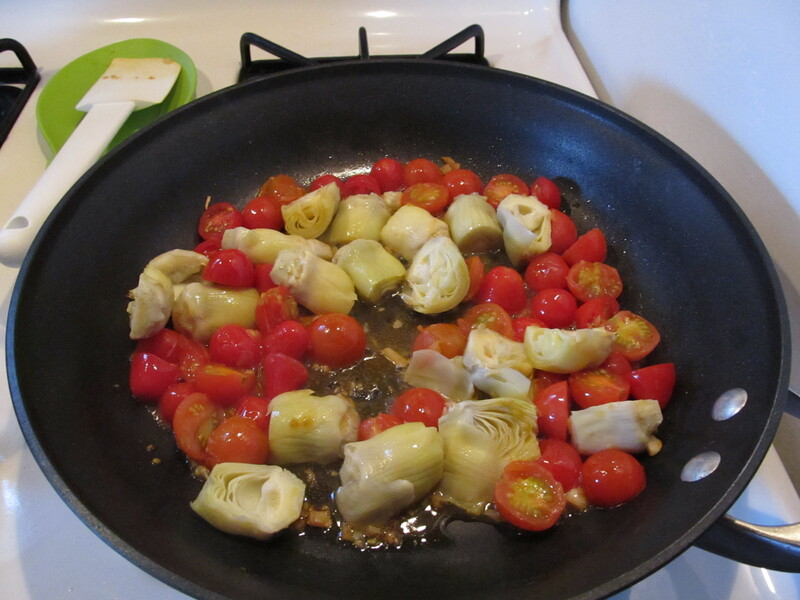 Since artichoke hearts don’t have a ton of flavor, I decided to add some cherry tomatoes from my garden to the mix. 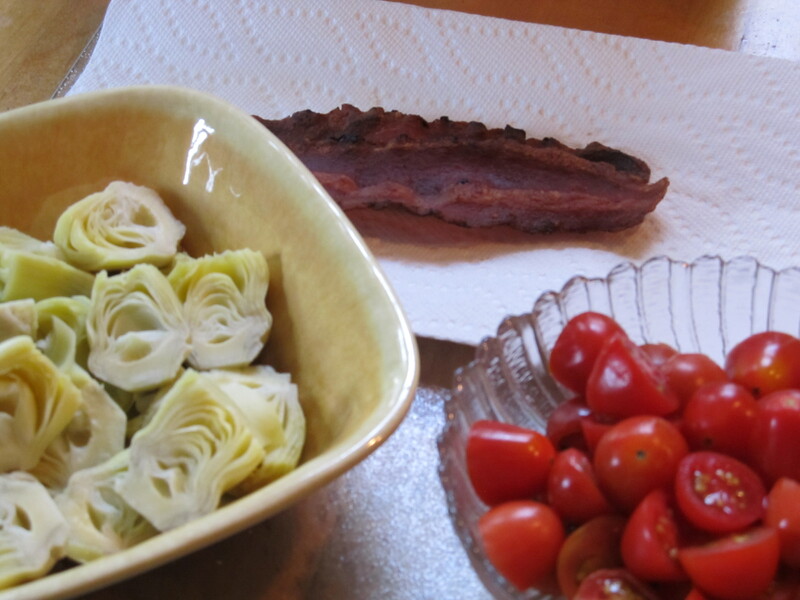 So, at this point, I’ve crisped the bacon (which will go on Bonnie’s portion, but not mine, as I am still not eating meat…and holy crap, do I miss bacon), and cut up the tomatoes and artichoke hearts. 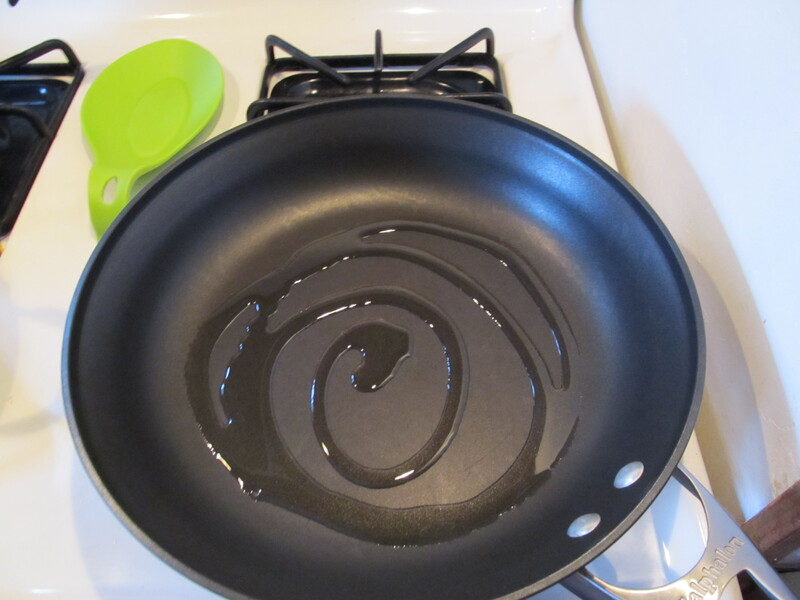 Next, a little oil in the frying pan and add some garlic (you might also note that other ingredient: red wine…this does not go into the dish itself, but into the cook, which makes for a much more pleasant cooking experience). 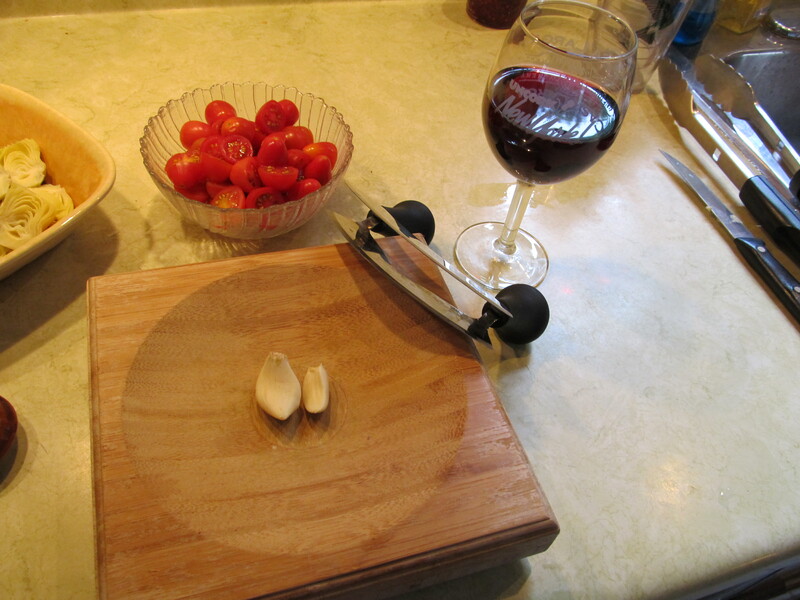 Sauté for a couple minutes, and then add the tomatoes, then the hearts. I added salt, pepper, and a little Italian seasoning, but you could pretty much do whatever you want at this stage. This is where I’d alter it a bit next time. I added a small amount of vegetable broth to keep the tomatoes and artichoke hearts from being too dry and to make a bit of a sauce. I was concerned about adding too much and having the sauce end up being too thin, so I played it safe. Turns out, I should have added a bit more because most of it did cook down, and it was a tiny bit drier than I would have liked. So noted for next time. I cooked up about half a pound of linguini as my pasta (this is more than enough for two people, but I am half Italian and have an inherited inability to cook the proper amount of food without going over…by a lot), then served the garlicky tomatoes and artichoke hearts over it. 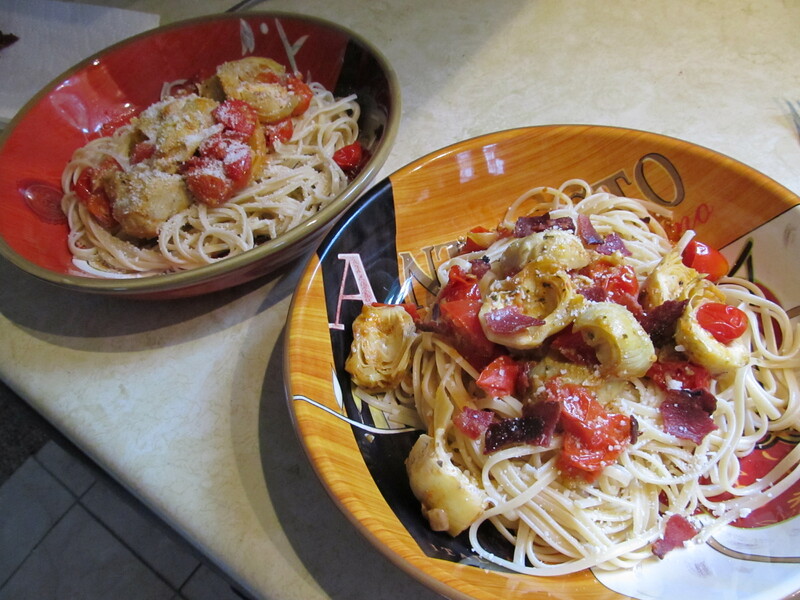 Next, I crumbled the bacon on top along with a sprinkling of parmesan, and voila! Mangia! Not gonna lie: it was damn good. I’d make it again in a heartbeat. Give it a try and let me know how yours turns out. Looks like a winner / keeper / repeater !